Big mistakes have been made recently and the club's strategy has been found wanting, most notably in the wage structure department. Lessons must be learnt, we must restructure our wages but this will take time as the dross is shipped out, we must also get our business done earlier next time round. Arsene and the Board must learn these lessons and adapt, we must also hold them to account and try to find out exactly why things were left so very late in the day when they should not have been. However given the position we were in on Sunday after the 8-2 mocking at Old Trafford, any self respecting Gooner would have bitten hands off for Arteta/Mertsacker/Benayoun/Park/Santos. Arteta and Mertesacker are particularly key for me. The former has been such a key player for Everton for so many years, he can play the holding role, he can defend, he can attack, he can pass, he's a great all round player with experience. The latter is also very experienced, despite never being a league winner with Bremen, he has been a consistent performer for them for many years as they have finished high up the Bundesliga. Overall I am absolutely delighted. Yes, things were badly managed and should not have been left this late. Yes, certain things need to be investigated and we need to change our antiquated wage structure. However I am the eternal optimist and given how bad things could have been, the last couple of days' business have been an absolute lifesaver for the club. Well done Arsene and the lads. I can conclusively tell you that 99.999999% of the transfer rumours you will read today will turn out to be complete fabrications. Essentially there are a lot of journalists and fans who have no real clue on who clubs are actually after. That is my accurate transfer exclusive. One minute a certain player is not leaving, the next minute they have left, then they haven't, then it's on again, then Harry Redknapp has nipped in there with an offer of a saucepan, two spoons and David Bentley's tash clippings, the club wants more, negotiations begin and then it all falls apart because the whole thing was completely fictitious in the first place. That's the transfer deadline day for you. On a serious not there is so much utter horse manure floating around on Twitter it is not true. Some chap posted a photo of Kaka and claimed he was at Heathrow today, shortly it was shown that this photo was 2 years old and not of Heathrow, but an airport in bloody South Africa. This was just the tip of the Twitter iceberg today! Our whole season is up in the air and rests on just a few hours action in the transfer market. Lansbury has gone to West Ham on loan, meaning that I'd be very surprised if the orders now weren't to bring in at least two midfielders. Given how hard it will be to get top players with just hours remaining, I would expect that the club will put several bids in around Europe and we shall just have to keep our fingers crossed that some of them come up trumps. Come on you Gunners! We already knew that Park Chu-Young was on his way, an experienced South Korean international with a decent record for Monaco, also pacey and capable of playing in wide areas if needed. This was a good start. This evening the news is breaking that Andre Santos, a Brazilian left back, is to sign from Fenerbahce, provided the routine is completed tomorrow. He looks a highly gifted player with a cracking left foot, he has caps for Brazil and is apparently not too shabby defensively. At 28 he is also an experienced pro, his goal scoring record is also quite remarkable, averaging about 1 in 5 but he has played in the midfield a fair bit for Fenerbahce apparently. It is also highly unlikely that these will be our final signings. I think a big name midfielder, an attacking midfielder and a centre back are all likely to also be on our shopping list. I can't remember the last time a transfer window was so breathtakingly exciting and scary, all in one. Certainly I don't think the club has been wise to leave all this to the last minute, but it isn't half seat of the pants stuff! The gravity of yesterday's result and performance has struck me this morning when reviewing the game on the TV. That was a bad performance, it was far worse than bad, it was absolutely catastrophic. Our squad is an absolute shambles and the season is underway, we have one point from three games. Injuries and suspensions left us short, but no squad should be so short that it has to throw in so many raw youngsters into such a huge fixture. Our squad is incredibly weak, we have sold big players and several useful squad players, while others have gone out on loan because no one would buy them outright and pay their full wages. We have only eight defenders in the first team squad, one is useless and is being frozen out (Squillaci), one is forever injured (Gibbs), one was injured all of last season (Vermaelen), one is injury and error prone (Djourou), one is useless (Traore), one is an inexperienced kid with talent and heart (Jenkinson), one is Laurent Koscielny who is relatively inexperienced and the other is Bacary Sagna. So in a huge football club with a wage bill in excess of 125 million pounds or so, we have a squad with only eight defenders, of which very very few are experienced pros without injury issues. Our midfield is not in quite as bad a state as our defence but it's not much better, only a couple of injuries and we are down to untried kids. Yesterday was a disaster that has been waiting to happen for some time, it was no freak result, we are down to the bare bones and this should have been foreseen, preempted by the manager and board. Ultimately one man has to take responsibility for this mess and it is the manager who is that man. The defending was what one would have expected from a back four that had never played together, a back four with no experience, a back four with very little togetherness and defensive organisation. Still, there was no good excuse for someone like Johan Djourou yesterday, some of his defending was terrible for such an experienced player, he failed to attack the ball for the first goal, he was frequently not tight enough to his man. Armand Traore should be able to defend better too, he was truly terrible given the number of top flight games he has played (over 40). It was the lack of defensive cohesion and strategy that worries me most. You could bet your bottom dollar that if George Graham had time to work with that back four for a month, then they would play a damn sight better than they did yesterday. Arsenal's defending looks as if it receives very little attention on the training pitch and if this is genuinely the case, it is absolutely staggering because we have been throwing away points for years now, points that would not have been thrown away if we could do the basics better. I am a massive Arsene Wenger fan but although it pains me to say it, Arsene is now at his last chance saloon and if he does not see this then he is truly doomed. We need an absolute minimum of four more signings, after the arrival of Park. Not only that but he must start taking defending far more seriously and he must seriously think about appointing an experienced defensive coach who can go about drilling our defense in the some basics, to prevent disaster like yesterday from happening again and again in the future. Arsene, it is now time to change or be changed. Ignore the opposition, ignore the refereeing, ignore the personnel missing, ignore the away crowd, ignore the lack of confidence, ignore the weakness of our squad for a minute. The defensive organisation and strategy exhibited by the side today was weaker than weak, it was truly depressing to watch and the culmination of years of ignoring a key part of the game of football, keeping the ball out of one's own net. It was pub defending, it truly was, players were bombing forward and leaving their positions vacant even when we were several goals down, there was never a thought to try to shut up shop. The marking was utterly pathetic, Manu players were given far far too much time and space again and again. There was so much ball watching, several would rush to the ball and leave others unmarked. I could go on and on. It all smacked of a team that have not been adequately coached and drilled from a defensive point of view. It is an absolute shambles. There are other problems too, certain players are not Arsenal quality, the squad is perishingly weak. However for me the defensive setup at the club must be overhauled or we will continue to give goals away like this, and we will never win anything without being able to defend. "The PGMO look at the fixtures 6 weeks ahead, pick the right refs for the right games, then review this on a weekly basis. They take all factors into account, other games they have reffed, who they support, distance to travel, and in some cases international refs may have reffed in Europe during the week, and this all impacts on availability." 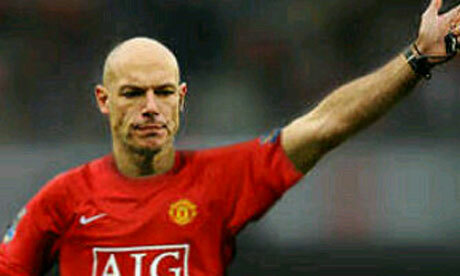 Howard Webb is refereeing today at Old Trafford and I will leave you all to read into this what you will. The point I am making is the process by which Howard Webb has yet again been selected for a Manchester United game is completely nontransparent and open to manipulation. Mike Riley, who as a referee was notorious for being rather weak and giving Manu a string of dodgy penalties at Old Trafford, was appointed as the general manager of the PGMO in June 2009. I am not accusing Mike Riley of being corrupt by any means, I am just pointing out his history of being rather easily intimidated by clubs and players, he appears a bit of a 'yes-man', an all too frequent personality trait within football's governing bodies like the FA. The process by which referees and other officials are selected for games need to be made far far more random so that it is far far less open to any bias or manipulation. Obviously the clubs supported by officials and certain time constraints mean that not all referees can referee every game. However the current manner in which a panel selects officials behind closed doors is so open to corruption it is not true. The Italian match fixing scandal was far more subtle than many would have imagined, it involved a complicated network of cosy relationships between clubs and match officials, and a system for appointing referees that was open to manipulation. The current system run by the PGMO is just as open to manipulation as the Italian system, we have no idea at all what communication goes on between the PGMO, officials and clubs; in fact exactly what happened in Italy could be going on right now in England and we would have no clue. We already know that the top referees are a remarkably warped bunch in terms of their geographical origin, this must have some effect upon their levels of subconscious bias against certain regions or clubs. Add this to the PGMO's nontransparent selection process and you have a recipe for one hell of a lot of bias, and potentially corruption. It is very depressing stuff indeed. I am just amazed that the mainstream media has never addressed this topic at all. I can confirm the Modric rumours are true, he has joined the notorious Nasri gang of treacherous little c*nts who care more for money than anything else in life, perhaps he should go to City to make up for Adebayor's departure? Who knows. I seriously feel a little sympathy for some Tottenham fans in this area, players like this are the scum of the earth in my eyes, they should show more respect to their contract and their fans. Still it must be remembered that a significant number of Tottenham fans racially abused Adebayor when he played for us. By signing Adebayor on loan Tottenham may have also just lost any hope of clinging to that thing known as moral high ground, it will be amusing to see Spurs fans getting behind Adebayor, the very same fans that racially absued him, deep down they must remember what they sung at him and what a repugnant greedy piece of shite he is. Harry Redknapp has never heard of ethics or morals though, tax laws too for that matter. What I can tell you is that our Champions League draw is not awful and not easy, somewhere in between as it most often is. It is terribly sad to see City get such a tough draw, my heart bleeds pound coins for them. Marseille are a solid side, French champions of 2010 and Dortmund are by far the best of the fourth pot teams, German champions damn it. Olympiakos make up the numbers and are by far the weakest side, still Athens will be a tough away fixture for sure. As long as we don't get complacent we'll have a great chance of going through. On the transfer front it's just about six days to the hour to go until the window shuts, hopefully Arsene won't get his arm crushed in the process and will have already secured several quality signings before the deadline. There are a lot of rumours circulating tonight about Kaka and Hazard. Apparently the Kaka deal is almost done, Madrid just have to agree to pay about a quarter of his wages for the year long loan. Hazard is reported to have agreed terms and it seems that we are not far off in the bid department, about 25 million pounds may be enough. There are also rumours a la Gary Cahill. I take it all with a large bag of salt to be perfectly honest, but I cannot but hope that some of it is true. That was Sterling stuff. We were up against it tonight, the stinking tabloid hacks were sharpening their knives, we had a few injuries, we were away from home against a very strong side. A lot of people wanted us to fail tonight and we didn't, we showed a lot of strength and heart to come back from a goal deficit at the break, and proving worthy winners in the end. Jenkinson remained at right back with Sagna at left back, Frimpong started in the middle of the midfield in the holding role with Song and Ramsey alongside him, Walcott and the immense Gervinho flanked RVP. The first half was a cracking spectacle, truly end to end stuff. 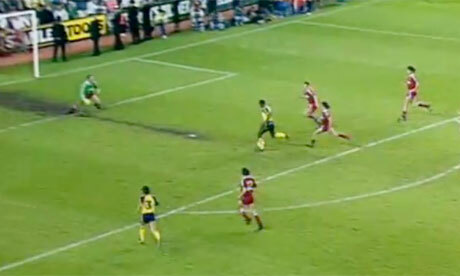 Gervinho looked dangerous on the breaking, weaving this way and that, Theo's pace scared them. Di Natale was a theat, his movement excellent and he clearly has the snout for a goal. Udinese also had a lot of pace in wide areas, Sagna did not look comfortable in the left back slot. Udinese took the lead just after Gervinho had teed up Theo for a great chance which was expertly saved by their keeper. A neat cross in was headed precisely into the top corner and in off the post by Di Natale, Szczesny had no chance, Djourou could have been closer, the midfield also were not protecting the centre backs adequately. We saw the half out and 1-0 down it was at the break, on came Rosicky for Frimpong, Song moving deeper to where he should always be. The equaliser came early on in the second half, Gervinho skinned his man, cut back a delightful side footed cross, RVP did the rest. The second goal came courtesy of a great bit of pace from Theo, a lovely touch inside and a great finish. 2-1 and the game was done. In between those goals the useless referee had given the most ludicrous of penalties for the most accidental of handballs by Thomas Vermaelen, the extra UEFA officials proving their complete uselessness. The outstanding Szczesny made a terrific one handed save from Di Natale's kick, a key moment. There were many other incidents, some pathetic diving from the Italian side, a nasty deliberate elbow that was missed completely by the pointless and useless extra UEFA men and several great pieces of defending from Tomas Rosicky. Rosicky's overall contribution was key, and the change in the midfield was so key because Song is not good enough in a more offensive position, he simply has to be told to stick just in front of the back four. There were a lot of positives from the game tonight. Szczesny is looking better game by game, a brilliant goalkeeper already and he will only improve. Jenkinson really impressed for one so inexperienced, he concentrates well and never stopped running. The centre backs were decent, Sagna struggled at times positionally which is to be expected. Ramsey was tidy and grew as the game went on, Song was a player of two halves and the less said about the first half the better. Gervinho was the stand out performer, it was his cutting edge that turned the tie around for us. RVP and Theo put in solid shifts. Overall a great night's work, now for some signings Arsene! Ignoring the current disaster that is our squad the the manager's failure to strengthen over the course of the summer, our home record has been a cause of concern for many months now and the Liverpool result yesterday was a continuation of this, and not a one off freak result. Last season we only won 11 of 19 home league games, picking up 37 points in the process. Certainly reasonable home form, but nowhere near title winning, in contrast to our relatively superior away record. Interestingly we only conceded 15 home goals, not a bad record given the media's hype about our defending, while we scored just 33 home league goals. Interestingly last season's home record was rather similar to that of 2008/9, it let us down then too, only 31 goals scored and 38 points picked up at home. Maybe I am reading too much into things but it seems to be that we are struggling to open up teams at the Emirates and this is not a new thing. There are many factors at play here, a big one for me is the 4-3-3 formation, the way in which playing with a lone striker can leave that player a tad isolated and make it too easy for a team to sit back against us, park the bus and then hit us on the counter. For me we need wise up tactically, tempt teams out a bit more and play more counter attacking football as we used to with our last great side. Players like Henry and Pires were masters of the counter. Yesterday summed this up, it was a very even game, one which we were genuinely unfortunate to lose, but no one could argue that we created enough in terms of clear goal scoring opportunities. Liverpool did defend well but we made it too easy for them. There was not enough support provided for RVP with the front three system, for the 4-3-3 to work properly we needed the wide forwards to play more centrally at times. I would like us to revert back to a more traditional 4-4-2 formation for some home games, the squad certainly needs more adjustment for this to occur though. Liverpool didn't create much either though and they needed the help of the officials, as well as lady luck, to break us down. Emmanuel Frimpong had a cracking game until his early bath and was rather unfortunate with both cards in my opinion. The first was bad refereeing, a minor confrontation when Frimpong believed the throw in was his, the second a late clip of Lucas' shin that could be argued to be a yellow of course, but it was relatively tame for me though, he had half pulled out of the challenge, it was not out of control and Lucas was looking to get him sent off with the grossly exaggerated reaction. Frimpong was niave though, with experience he will completely pull out of those kind of challenges and not give Lucas the chance to roll. Liverpool were very average throughout and that it what makes the defeat so concerning. They didn't create much of note other than a Carroll header until Frimpong had harshly seen red. The opening goal should also never have stood, Suarez was offside when the ball was played to him, Miguel's clearance then freakishly deflected in off Ramsey's torso, a really unfortunate way to concede. With ten men we never looked like getting back in the game and the second goal was simply academic, other than demonstrating the stupidity of FIFA's ridiculous offside rule. We were terribly unlucky not to come away with a draw yesterday but the fact that we didn't create more against such a mediocre Liverpool side is very worrying for me indeed. A lot has been said of our defensive problems of late, but for me an issue of at least as much concern is our inability to break teams down at home. We have only one striker who can score goals (RVP), Chamakh looks like a lost sould and Bendtner is looking for a move away. Andrei Arshavin has never looked at home on the left flank and that leaves Theo Walcott who is still developing. We badly need more offensive options. Interestingly it has now been proven that we did not get our fair share of decisions last season, this is from a neutral journalist too. Other statistics also make out that all teams and players are not treated equally by referees. I did by own bit of digging to come out with these statistics from last season, here are the average disciplinary points (1 point yellow, 3 red) per fouls committed each game for these teams: Arsenal 6.9, Manu 5.9, Chelsea 5.2, Man City 6.4, Bolton 5.9, Newcastle 7. I am certainly not a 'conspiracy theorist', I just happen to think that refereeing standards are pretty poor and the officials need for more help from technology in order to minimise error. Certainly yesterday England's 'leading' ref Howard Webb provided yet more evidence of just how bad refereeing is in this country. He lost control of the game by keeping his cards in his pocket early on, he tried to keep things even rather than enforce discipline consistently and he got a lot of big decisions wrong. Ryan Taylor got away with swinging an elbow at Gyan's head, Bardlsey got only a second yellow for a rather brutal tackle on Coloccini, there were many other poor decisions too. Good refereeing is all about using common sense when interpreting the laws of the game, admittedly this is very hard these days given how stupid FIFA have been in introducing unworkable laws and diktats. It is also about being consistent, something we very rarely see in the Premier League. How often do we see a team come to the Emirates and commit five early fouls without a booking, the ref than books one of each side just to be seen to be fair. This is just useless on so many levels, the cards are pointless if one gives them out evenly regardless of what is going on on the pitch. Inconsistent refereeing like this is like haphazardly parenting, they are designed to create confused and undisciplined players or children, they will both lead to complete loss of control whether it is on the pitch or at the home. If every player who raised his hands against us this season were to get a red card, I would not complain about Gervinho's harsh sending off at Newcastle. The sad fact is that we all know that we will see players do far far less than Gervinho and Frimpong have done and stay on the field of play for the full duration. Don't forget your boots !! With a quick look back over the shoulder at the Newcastle and Udinese games, it feels something of a small miracle that we have made a half decent start to the season. However, it is somewhat laughable to see Carl Jenkinson being put forward as the club's spokesman on the two clean sheets earned this season so far. I mean, the poor lad has only just made his debut in the deepest of water and frankly, it wasn't hard to see that he will take some time to make the jump between Division 1 and Champions League football !! In fact, the second half against Udinese was really quite shocking. The fact that sicknotes Gibbs and Djourou are already crocked comes as no surprise whatsoever and only underlines the massive gamble that Wenger is taking by putting so much faith in these players. Similarly, the abject performance of Chamakh makes it very hard to understand why Wenger has not invested more faith in Bendnnnnter. I know he is not everyone's cup of tea but Wenger's insistence on playing Nicky B on the wing for the last 3 seasons is just bizarre. Plus what is the point of putting him on the bench on Tuesday if Wenger had no intention of using him? I don't think he even warmed up at half time. Suddenly, the six years of craziness that Eboue gave us looks like it could be missed. If that lunatic had ever managed to locate his pea brain and plug it in, then he could have been a great player. Certainly, I don't know many other Arsenal players who have played at such a variety of positions - right back, right wing and even centre midfield in the early days post Flamini and pre-Song. Defensive liability for sure, but Eboue was something of a Champions league specialist. So having scrapped past Udinese, we now have the TV glare firmly in our faces on Saturday morning and whilst I will be at the ground, those unfortunate of you who will be forced to see Redknapp, Souness etc demonstrating their early on-set of brain death in why Sky calls "expert analysis", the build-up to the game will be at least 45 mins of Arsenal and Wenger bashing. And whilst the moronic Redknapp and Souness are ex-Liverpool and so utterly biased, I for one take some small comfort in the fact that Wenger has not gone out and spent his vast piggy bank on the utter drivel that is Carroll and Henderson. £55m for those two unproven players is staggeringly shocking. Just stupidly unbelievable. Yes, you might be able to say that Downing, Enrique and Adams are better signings, and I would have to agree, but I suggest you ignore those three and just concentrate on how shite Carroll and Henderson are and then say £55m to yourself a lot. It will make yourself feel better. I promise. In the meantime, its probably better not to think what the Arsenal team will look like on Saturday, let alone the bench. However, everyone under the age of 40 and/or 17 stone who are going to the game should probably take along their boots, just in case. Including the girls. With Cesc gone, can the Wenger bloodbath be avoided? Right then peeps. 1979Gooner is taking a well earned break to re-charge his angry batteries, so you are getting a rare treat of half-baked nonsense from your Unkle Ted instead. Its been a helluva opening weekend in the Premiership, but maybe not for the reason that most people expected. However, first up is the long awaited news was confirmed today that el Capitano Cesc has re-signed for his homeclub Barca for around £35m quid, which on any view deserves top billing. 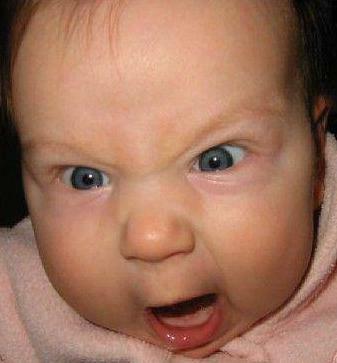 However, trying to balance my feelings about Cesc at this stage is not easy. Obviously, no-one who has anything to do with Arsenal has much time for Barca. The graceless bastards publicly court our best players every Summer and Cesc now joins the esteemed list of Wenger players off to the Catalan giants. By my count Overmars, Petit, Hleb, Henry and Cesc will have cost them total fees of around £90m, give or take the odd peseta. Staggering really. And in many ways, Cesc fits quite nicely into that list. He was clearly better than Hleb, almost certainly better than Petit, but then I have to pause for thought when you get to Overmars and Henry. I think I will just put him ahead of Stumpy and not quite up there with Thierry. So there you go. Cesc Fabregas - the second best player we have sold to Barca. The main difference is that this one was always going to happen. Cesc was simply desperate to go back and in the end, I think we are all just pleased the soap opera is now over. Until next Summer. Not the eulogy you were thinking of? Maybe not. And Cesc's stats for Arsenal might suggest more. Certainly 57 goals and 100 assists in 303 appearances is very impressive indeed. So why the limp priase? Cesc is a lovely footballer, truly a modern day midfielder that will grace almost any stage, but in trying to rank him among the greats, I feel there are certain limitations that he was never likely to overcome. Now I will start by saying that Cesc gets into most people's list of great players, but its never been clear where he plays. Defensively, Cesc was always pretty poor. You might say it just wasn't in his soul, and occasionally he put in a good defensive shift, but that was a relatively odd occasion. Most of the time it didn't matter, as Cesc was so good technically, but often against our biggest rivals, it often did. I think Darren Fletcher had his number, as did a number of the Chelsea trolls (Mikel in particular), neither of them on a par with Cesc in footballing terms, but nonetheless able to dim his light sufficiently. In the battlefield of premiership football, Cesc was only occasionally able to make his technique win the battle against a physically superior opponent. I think it is telling that he often had to be deployed almost upfront for Spain. Harsh you say? Maybe. I just remember long periods of the 06/07 and 07/08 seasons, which I think were Cesc's best, in admiration of what Gilberto and Flamini were doing behind him in midfield, giving Cesc almost a free role in midfield behind two strikers, which was something he rarely enjoyed in the last few seasons. Good midfielders like Cesc need runners to pass to and given that the current crop of RVP, Arshavin and Nasri were more likely to be coming towards him last season that going away, its not an easy task. So why the slightly limp praise for such a great player. Firstly, its the disappointment that he has gone. No Doubt. Secondly however, its a genuine optimism that Jack Wilshere is going to really shine in the next 12 months. And hopefully the next 12 years. Unlike Cesc, Jack has thighs like treetrunks. And more importantly, unlike Cesc, Wilshere is not from Barcelona. Indeed, name the last English player to play at the top level in Spain, Germany, Italy or France. Struggling? Probably Jermaine Pennant's 09-10 season at Real Zaragoza. Before that, I reckon its Beckham at Real Madrid. English players do not fall far from the tree. So good luck at Barca Cesc, I hope you get off the bench more regularly than your old mate Hleb. Speaking of English players, I simply cannot move on before venting some spleen about Joey Barton. What an utter sub-cretinuous species of neanderthal that man is. Ok, he gets to start on a small piece of high ground because Alex Song did a very stupid thing by stamping on him (3 game ban coming from FA headquarters shortly), but what then followed with Gervinho was some of the most embarrassing scenes I have ever seen on a football field. His ability to decide to teach Gervinho an impromptu lesson on not exaggerating a foul by, low and behold, massively exaggerating a foul, was truly gobsmacking. What depresses me afterwards is that Joey Barton then becomes the story, the troll no doubt feeding on arseholes like Henry Winter's utterly biased views in the Telegraph. Follow that up with a series of drivel posts on Twitter and then give him a slot on BBC 5Live's 606 show on Sunday for good measure. The man has no idea. 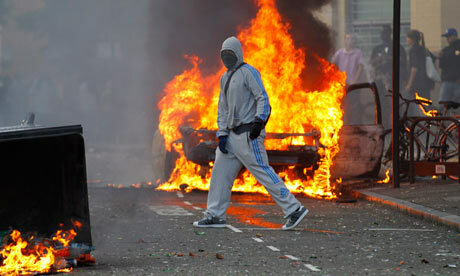 Joey Barton is the best example of what is wrong in the UK since the kids went rioting. Oh, that was only 7 days ago. And the Joey Barton show must not overshadow the stark reminders of Saturday afternoon's game against Newcastle. No Cesc, no Nasri, but it was the same old tippy-tappy no scorey football. We played some lovely stuff, we really did. But the front three of RVP, Arshavin and Gervinho could still be playing now and still wouldn't have scored. I don't think they give prizes for these sorts of things but 63% possession away from home with only 2 shots on target must be a record. No-one gets into the box, no-one shoots. All very frustrating. No wonder the away fans gave Wenger some grief. Which all means we go into these next few games with the whole team on edge already and Wenger on thin ice. A couple of bad results against Udinese, Liverpool and Man Utd and Henry Winter and his mates will be leading the charge to whip up the Wenger bloodbath. Surely it should never have come to this? Full backs: Sagna, Jenkinson, Gibbs, Traore. Centre Backs: Vermaelen, Koscielny, Djourou, Squillaci. Wingers: Walcott, Gervinho, Miyaichi, Arshavin. Midfielders: Wilshere, Ramsey, Song, Frimpong, Chamberlain, Rosicky, Diaby. In this I am assuming that Bendtner, Vela, Nasri and Cesc are on their way out of the club. Obviously there is a bit of flexibility with Chamberlain being more of a winger, Arshavin and Walcott being able to play centrally if needs be etc. It is clear that as things stand we are woefully short in terms of both numbers of quality players and in the level of experience throughout the squad. There are just so many positions in which we are taking a big gamble and in which we could become terribly unstuck. Relying on Gibbs to stay fit is a biggie, whilst putting so much pressure on the young Jack Wilshere is tough on the young man, despite his amazing talent. Several other players are rather injury prone, in this I include Vermaelen, Djourou, Walcott, Diaby and RVP. There are just so many disasters waiting to happen if things are left as they stand. Some of you may be surprised to hear this but I think that if Arsene does not strengthen the squad significantly now then I think he will be out of a job by this time next year. By 'significantly' I mean bring in one quality commanding central defender, replace both Cesc and Nasri with two quality midfielders, and bring in another quality forward. There is no room for excuses now, they simply will not cut it, a significant chunk of cash will be there after the sales of Nasri and Cesc and the penny pinching must stop, Arsene has to go out there and bring in some reinforcements. He just about has time to do this before the end of the transfer window. If he does not then I have to say that if excellent results do not follow in the Champions League and Premier League then Arsene will deserve to lose his job. I am sure many of you listening or reading about the AW press conference that happened at 9am today will be very frustrated and angry. Personally I am still anxious about the state our squad is in, but the press conference was quite clearly used to give absolutely nothing away to the media. AW's smiling and laughing gave the game away today, he was quite determined not to give the media any ammunition at all and this is precisely what he did. Why do I say this? Take the centre back situation, Arsene has spoken of our need for a tall commanding PL ready stopper and is in the market for one, as our bid for Jagielka confirms. Therefore his recent comments about not needing a centre back and the squad being big enough are not the honest truth, they are designed to keep his cards close to his chest and keep his bargaining position strong. "Ideally you want it sorted out before the season starts"
Arsene has made it obvious that Cesc and Nasri are both in the process of leaving the club, it would be utterly foolish of him to comment further on these deals at a press conference before they are done and dusted. I am amazed that some people out there expect him to do otherwise, it is utterly naive of them in my opinion. I am not defending Arsene's transfer strategy by the way, leaving all this until the last minute has been a bit of disaster for us. However it is utterly naive of people to think that he is going to talk openly about transfer deals that have not yet been completed, Arsene has never done this and never will. He is playing his typical game of transfer poker and taking the Michael out of the media in the process, I would not be surprised by this if I were you. Arsene knows we need reinforcements and that certain players need shipping out, he is quite clearly working on the case. He has some big decisions to make though as now is not the time for penny pinching, he must go out decisively into the market place or risk leaving us woefully short of strength for the season ahead. I hope he can do this, the problem is that there are so many people out there looking for any old excuse to vent their vitriolic spleens at AW and this is making his job harder than it should be. Football is not high up most Londoners agenda right now and with good reason. The events of the last few days that have seen gangs of feral chav youths rioting and looting various parts of the country have been truly appalling. 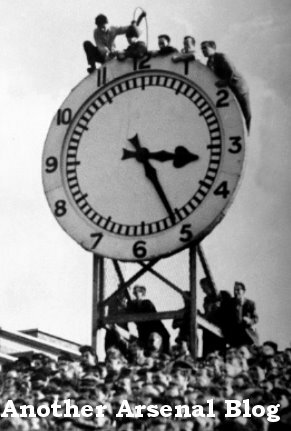 Football needs to be put in its place and it fades into insignificance in the context of the events of recent days. The Gooner who writes this blog is out doing his bit tonight, he is Alex Louka, aka AlexFortyNine on Twitter. He is part of a group of individuals from the Enfield community who are out in force in order to protect their local area from more of this mindless wanton violence. Alex and this group of lads have been out in Enfield and making citizens arrests of these feral scum, 26 so far I think. His family shop was looted and he is out doing his bit, I am proud that people are out doing this kind of heroic work this evening, it is simply fantastic that more and more people are standing up to the putrid scum whose behaviour is threatening to undermine the rule of law in our country for no good reason. There are many other tales of similar heroism from elsewhere in London, the Sikhs in Southall, the Turkish in North London, the Millwall fans on Eltham High Street and on and on. It seems to me that the left wing tree hugging approach does not work with the these youths, cuddling them and offering them help is not the way to go, they are not normal people with feelings and guilt, they are scum who only care for themselves and their own sick pleasure. I hope something good can come out of this disaster and well done AlexFortyNine, keep up the Sterling work, thanks to people like you many of us are having some of our faith in our fellow man restored. It's hard to add much more than the Arseblogger after last night's defeat to Benfica. There is no need for despair but there if nothing is done, then we are certainly in big trouble for the season ahead. A lot hasn't changed and obviously that's where a lot of the frustration comes from, this is very understandable so in my opinion. Even with a few key men out the first choice eleven did a decent job. Gervinho looks a steal, incisive and penetrating with most that he does. Gibbs played neatly and got forward well. Szczesny led the defence well. RVP scored again and got injured again. We deserved the one nil half time lead. The problem came with the depth in our squad, some are just not good enough while others are very very raw. This is a massive concern because given the length and intensity of our season ahead, these guys need to come into the side and pick up points for us on a fairly regular basis. Can anyone seriously say that they feel Chamakh is going to bang in 15-20 goals or that Squillaci is going to come in to keep several clean sheets? We are less than a week away from the season's opener at Newcastle and frankly our squad is a complete shambles. We have two key men who look like leaving (Cesc, Nasri). We have a striker on his way out (Bendtner) when our reserve centre forward looks as potent as a stoned Franny Jeffers (Chamakh). We have a real lack of strength in depth in the centre back position with some struggling for form temporarily (Djourou) and others more permanently (Squillaci). We also have several injuries and several of these are in very injury prone individuals (Vermaelen, Theo, Gibbs). If nothing happens in the next week then it will speak volumes. There will simply be no excuse for the lack of action in the transfer market. 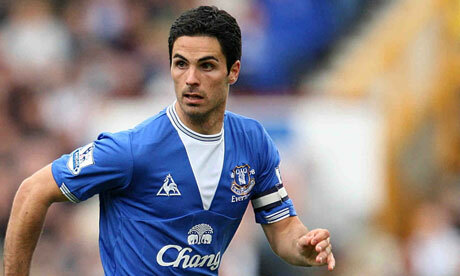 We need to get rid of Cesc and Nasri, we must then replace them with some real quality. On top of this we need a centre back and we must sort out the forward situation. I really hope the club has something up its sleeve. Arsene needs to change or he will fall on his sword, he must stop worrying about a million here or there, we need a strong balanced squad for the long hard season ahead. Sort it out Arsene. Something that I have given a lot of though to recently is the reasons for our failure to win anything in the past six years and I feel one large factor has been our lack of a strong British spine in the side. Take Arsene's double winning sides and the invincibles, they all had this British spine in the squad and this is what we have lost in the past few seasons. The reason for the importance of this British spine shall be explained. Firstly I have nothing against foreign players, this is no tabloid rant of xenophobic drivel. However it is ludicrous to forget the importance of team spirit, leadership and togetherness. 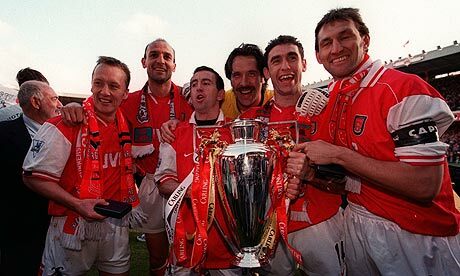 It is imperative if one is going to be successful to have a squad without divisions, a squad that gets on well together socially and that all speak the same language fluently, a squad that understands what Arsenal Football club represents and a squad of players that above all wants to die fighting for the club that they love. In recent years we have seen too many players represent our club who do not have the right mentality to be Arsenal footballers, players who do not give their all on the field every week. We have also seen too many first team players become uncommitted to the football club. These factors combined with the lack of leadership from the club captain have seen our ship become rather rudderless. Gallas was an appalling captain, Cesc has been no leader, the handing of the captain's armband to the uncommitted Nasri was an insult to our football club. Players who do not want to play for our football club should not be made club captain and should not be kept at our football club, no matter how good they think they are. The future of our football club is better off in the hands of players like Jack Wilshere than Cesc Fabregas. We need more players who love the club and who support the club. Players like this are far less likely to ever be tempted away by the big foreign clubs, they are also far less likely to be tempted to run their contracts down and shaft the club they support. Carl Jenkinson is a Gooner and one thing one knows is that he will always put his heart and soul into every single game he plays for us. Players brought up at the club from a young age and who have the club's mentality instilled in them are far less likely to ever want to leave for big money elsewhere, they will be far more loyal and dedicated to the cause. Part of the reason for Alex Ferguson's success is that he has kept hold of his great players on the whole, the likes of Scholes, Giggs and Keane never wanted out. Generally British players do not want to play abroad, unfortunately many of our great foreign players have wanted to go to Italy or Spain in their prime. It is also important that the foreign players we bring in around this core of British talent have this Arsenal ethos instilled in them, they must know that a lack of commitment is not acceptable, a larger British core would instill this in our squad and when combined with our technical excellence it would have the potential to be truly unstoppable. The players brought in must be of the right character and sort. It is to Arsene's great credit that he has revolutionised our youth system and we are seeing a generation of committed British talent developing at the club. We have seen Jack Wilshere become a first choice starter in the last year, Ramsey can do the same, Gibbs can too provided he can stay fit. There are some other fine fighters waiting in the wings in the form of Frimpong, Bartley when back from his loan, Lansbury, Jenkinson and Afobe. It would be great for the long term future of the club if as many of these homegrown British players can make it as possible, they are not going to start pining for a return to their homeland at a later date, Arsenal is their home. We have some truly excellent and highly committed foreign players who also give nothing short of 100% every time that they put on their Arsenal shirt. The likes of RVP, Vermaelen, Sagna, Song and Szczesny always give their all and fight for every scrap. We must weed out the uncommitted, keep this core of committed foreign talent, combine it with our homegrown fighters and then make the right additions to this group, then we have a chance. If we do not do this and persist with some of the uncommitted players who simply do not have the right attitude for Arsenal FC, then the rot will persist and the failure will continue. Barcelona FC have yet again been told to stick their pathetic and insulting offer. If I were Cesc then I would feel rather humiliated that the very same club had just paid over 30 million Euros for another player with nothing like Cesc's track record. Barca are also unable to even match Cesc's Arsenal wages. Consider Barca's 30million offer in the context with Ashley Young (20million), Dowding (20million) and Henderson (20million: it is an insult. What a bunch of bankrupt tossers. We face Udinese in the CL qualifying, not an easy prospect by any means, though it certainly does help that they have lost several of their best players this summer. A 19-man squad travels to Benfica for the friendly tonight and there are some rather interesting absentees. Cesc and Nasri appear to be absent for the obvious reasons, as are Eboue and Bendtner, Vela may be on his way too. It is ominous that are injuries are racking up so early; Gibbs, Kos, Diaby, Jack and Theo are already out. It is encouraging to see Jenkinson, Frimpong, Miguel and Lansbury included. Time is running out. I'd be highly surprised if new signings are not made soon, but if they are not then it is hard to see our current squad proving to be strong enough for the challenges ahead. Now is not the time for haggling or penny pinching. We have money and must spend, it is as simple as that. It is Arsene's last chance saloon. Another day often gives one just a bit more perspective and after personally I think those that booed the team on Sunday are looking even more stupid that they did yesterday, time and perspective will do these fools no favours. Arseblogger hit the nail very firmly on the head this morning, there simply is no decent justification for such behaviour. Some excellent points were made on the blog yesterday by readers. The impact that such pathetic booing can have on player retention was a very salient one. The negative atmosphere at home games is now part of a kind of vicious cycle, the players can't be looking forward to the lack of 'support' from certain sections of the crowd, it really cannot be helping us get results at the Emirates. Of note our away record was considerably better than our home one last season. The 'Gooner in Exile' makes some great points that I would urge you all to read. One thing I cannot stand is this consumerist attitude of some so called Arsenal 'supporters', they seem to think that paying for tickets means they can come along, whinge, offer very little support and a 'right' to boo the team at pre season games. Frankly we'd be better off with empty seats than having these morons dragging us down. If you don't want to pay the price you are paying then simply don't, it is a free world, but don't come to games if you are not going to get behind the team. Arsenal needs supporters, not just paying spectators who see themselves as entitled consumers. Thinking you have a divine 'right' to boo is a very selfish, short sighted and depressing attitude to have in life. There are certainly some situations when booing can be justified, for example if a particular player has shafted the club, or if there are clearly players out there not putting in the effort. For example if anyone deserved a booing at the weekend it was Samir Nasri. However booing a team that has given their all is not productive in my eyes. If people have a problem with the management then they would be better off protesting in other ways, but we saw at the end of last season that this bunch of angry small men was pretty tiny, still their boos can be quite loud despite their small minority status. In conclusion just to reiterate some of the points I have had to repeat over and over again, there was simply no justification for the booing yesterday, it was stupid, divisive and can only be negative for the club we love. That is not to say that we cannot discuss certain problems that the club currently faces with key players on the verge of leaving and in need of significant reinforcements. The manager has to change his approach, we all know this, but for God's sake let's give him the chance to do this and then judge him. If we start to crucify him and his players before the season has started we could be the catalyst for our own demise. The Arsenal Squad 2011 - stronger or shambles? Verdict: Fantastic in terms of young talent but there is an obvious lack of experienced combative players who can stay fit, that is my huge concern, because we look too small and lightweight at times and should not rely on Jack and Aaron, they are young developing talents. Overall I am much happier than I was a week ago. The defence is stronger, we have more pace and width in the squad, and we have no one who is not committed to the cause now that Cesc and Nasri have gone. I am most concerned with our striker situation, with Bendtner going we have very little quality backup to RVP, Chamakh looks drained of all confidence, a lot of pressure is going to be on the new South Korean Park and it is asking a lot of him in his first season. I also have concerns about the midfield as we are looking very reliant on our younger squad members, we really could have done with one M'Vila type of addition.